Te Rehia Theatre begins their show with a land greeting and acknowledgment in Te Reo from performer Tainui Tukiwaho and a song of support from two other members of the company. The company is obviously very aware of how green their audience is to Maori culture and patiently explained the meaning behind each part of the greeting. This also gave us a little preview into SolOthello, which is set in “the context of a war between tribes in pre-colonial New Zealand” and mixes dialogue in Te Reo and contemporary English with the original Shakespearean prose. Performer Tukiwaho delivers a series of mesmerizing performances as the four main characters in the play: the dignified Othello, a comically villainous Iago, a foolish Roderigo, and a silent but stirring Desdemona. 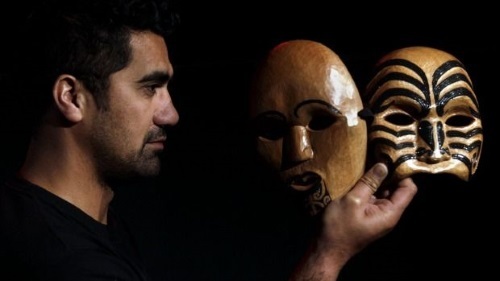 Except for Othello, he transitions between characters through the donning of traditional Maori masks (Te Mata Kokako o Rehia) and the strength of Tukiwaho’s performance lies in his ability to fully transform, physically and vocally, into four very distinct characters, sometimes in the blink of an eye. Ordinarily a tragic commentary on race, sexism, and psychological warfare, I have never seen Othello interpreted through a comedic lens until SolOthello and they make a good case for it. While some of the themes got a little lost for me – I thought the portrayal of Othello was a bit too still at times and I wonder whether making Iago a villain you love to hate diminishes the severity of his crimes – Tukiwaho’s ace comedic timing is irresistible. SolOthello provides a great argument for why many consider Shakespeare’s tragicomedies some of his most affecting plays: the comedy in SolOthello seemed to make the tragic moments feel all the more poignant. However, there were times when I wished that Desdemona, the only female character in this production, wasn’t also the only non-speaking one. Yet, as the show went on, I realized that Desdemona’s non-verbal methods of communication (through gesturing, dance, and music) were no less affecting. Tukiwaho’s movement work is devastating and the way that Desdemona strokes her wedding bed after being accused of infidelity transcended words for me. The creative team of Performer Tukiwaho, Director Craig Geenty, and Creator Regan Taylor should also be commended for their ingenious and hilarious multi-purpose props and set design. The set is spare, with only a trunk and a sheet hung from a clothing line, but the production makes full creative use of these components. There is also a particular set joke involving a bush that I am loathe to spoil for you. SolOthello will play as a part of the 2016 RUTAS panamericanas Festival at the Aki Studio in the Artscape Daniels Spectrum (585 Dundas Street East) on October 7th at 7 PM and October 8th at 8 PM. The 2016 RUTAS panamericanas Festival runs from October 5th to the 16th. A schedule of all the events can be found here. Tickets range from $25-$20 and there are still deals available. They can be purchased online, by telephone at 416.531.1402, or in person at the Aki Studio Box Office one hour before the start of the show. Photo of creator Regan Taylor provided by the company.